Contactless credit cards are coming, making it super simple to pay in stores: You’ll hold your card near a payment terminal, which will pick up data transmitted by radio waves. Before you start stocking up on RFID-blocking accessories, consider whether they’re worth it. The U.S. will see a gradual shift to contactless cards in the next three to five years, said Russell Palmer, STCU’s card services manager. In Europe, the switch is mandated to happen by 2020. While some may bemoan change, Palmer says there’s nothing to fear. Do you need special protection for my card? For starters, you probably don’t have an RFID chip yet. If you do, there’s security built into the technology, including “tokenization,” which means the information the card transmits changes with each use. In theory, a fraudster could read your card’s information without your knowledge. But if they did, they’d only be able to use it once. And that’s only if you didn’t use your card first. For a thief, it’s a lot of effort for very little or no return, Palmer said. 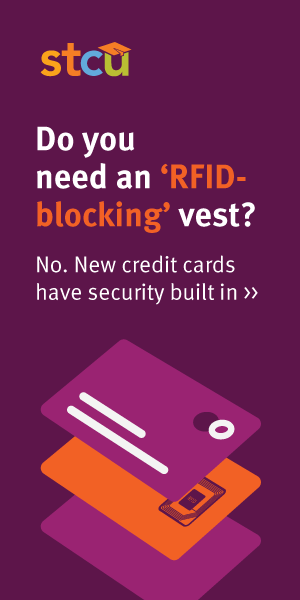 As for the wallets, credit card sleeves, and even vests and jeans promising to protect your contactless card: “In my mind, they’re a waste of money,” Palmer said. Learn more by reading STCU’s financial education blog, “My life, my money,” at stcu.org. Published: March 10, 2019, 3:09 a.m. Updated: March 24, 2019, 2:09 a.m.